This week we are showing off the Cook Station in Papa’s Sushiria! 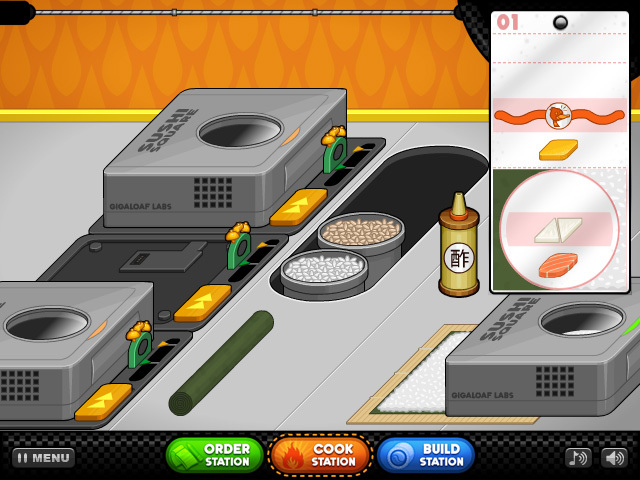 After taking your customer’s order, you’ll head over to the Cook Station to prepare the sushi rice. First you will place the Nori paper on the bamboo mat. After that, you will pour the rice into the Sushi Square. The Sushi Square is an all-in-one sushi rice cooker that uses the latest and greatest rice cooking technology. There are two stages to preparing the perfect sushi rice. First you have to wait for the rice to be steamed. When the cooking meter reaches the green arrow, the steaming process is complete. You will then need to pour some Sushi Vinegar into the Sushi Square. This will start the gentle mixing process. 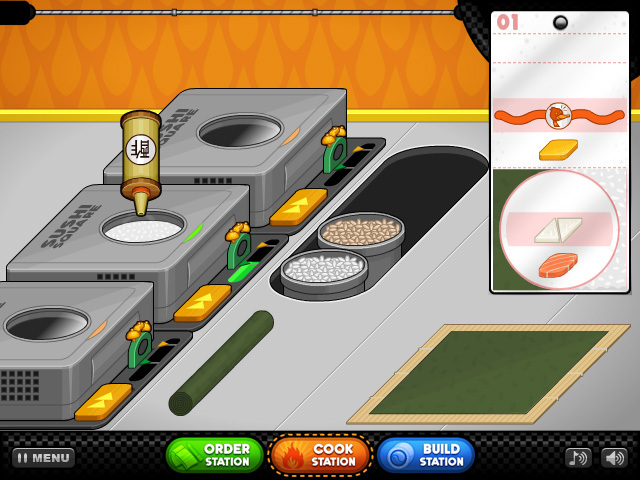 Once the the cooking meter reaches the yellow arrow, the rice is finished. You can then pick up the Sushi Square and place it on top of the rolled out Nori paper. The Sushi Square will then roll across the Nori Paper, spreading out a perfect layer of rice. From there, you will head to the Build Station, but we will save that for another day. Stay tuned for more sneak peeks of Papa’s Sushiria! hm... "Gigaloaf labs" eh? I bet it was "invented" by Professor Fitz LOL. hmm, I don't know. But I don't think the build station will be too hard either. This will probably be no harder than the Bakeria, and it can't be as frustrating as the Hot Doggeria where you'd have nine customers per day lol. Good enough but why 3 stations only? It seems easy but I will wait to see how this game play works.